Mirror mirror on the wall, which states are the most energy efficient of all? 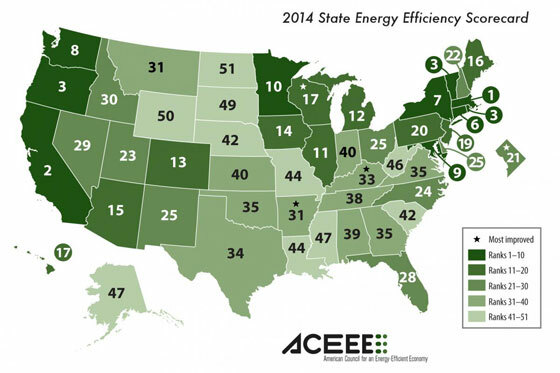 When the American Council for an Energy Efficient Economy released its 2014 rankings for state efficiency, the states at the top of the list were Massachusetts and California. Wisconsin, the District of Columbia, and Kentucky were also among the most improved. Gilleo says the scorecard helps states and their residents understand how they compare to others, and encourages them to waste less energy. Benefits include economic growth, cheaper energy bills, and a cleaner environment. Photos source: American Council for an Energy Efficient Economy (see below).